Black and white image of a locomotive pushing at least two passenger cars along a track, while a group of people rush along a sidewalk beside the track. 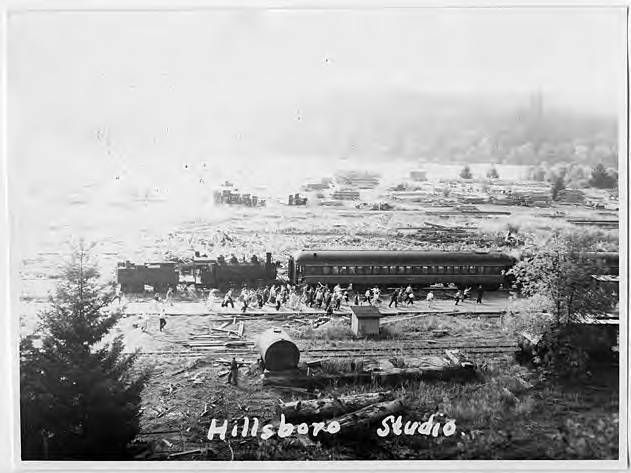 Museum records do not identify either the train or the date, but given the passenger cars, this is likely a pictures of the Vernonia, South Park & Sunset Steam Railroad, a nonprofit tourist and excursion train that ran from 1964-1969 from Banks to Vernonia. See WCM_012932, WCMpic_012940, and WCMpic_012936 for more images of this train.